Dato’ Zahrah is the Chief Executive Officer (CEO) of the Companies Commission of Malaysia (SSM). Dato’ Zahrah is experienced in financial and auditing matters and was previously an Advisor Accountant with the Royal Malaysian Customs and Excise Department and Principal Accountant with the Ministry of Foreign Affairs. Dato’ Zahrah is a Board Member for the Certification of Certified Integrity Officers and XBRL International (XIl) and is also a member of the Financial Reporting Foundation (FRF), Board Member of the Labuan Financial Services Authority (LFSA), the Inland Revenue Board (IRB) and the Audit Oversight Board (AOB). In 2018, Dato’ Zahrah was re-elected as an Executive Committee member of the Corporate Registers Forum (CRF) (a position she has held since 2016). 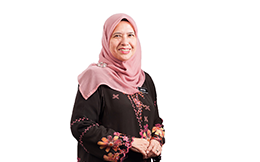 Dato’ Zahrah is also an Adjunct Professor, Department of Marketing and Entrepreneur Development (MAED), College of Business Management & Accounting, Universiti Tenaga Nasional. Dato’ Zahrah, who graduated with a Bachelor of Accounting (Hons.) degree from the National University of Malaysia, is a member of the Malaysian Institute of Accountants (MIA) and is a Chartered Accountant (CA). Transforming Business: How can structured data improve outcomes?